Embrace the holiday spirit in the beautiful state of Kentucky. It’s a great time of year to spend those un-used vacation days. Plan a quick winter weekend getaway before the end of 2018. Discover one (or all) of these five charming Kentucky small-towns! With a population of just over 21,000 people, the small town of Ashland thrives with art and entertainment. Located in the foothills of the Appalachian Mountains, this town is a charming retreat. Its quaint downtown offers plenty of unique places for holiday shopping. 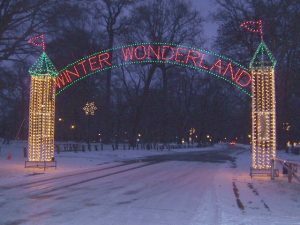 Families will enjoy the Winter Wonderland of Lights Festival that celebrate two months of events that during the Christmas season. Train rides, light displays, decorating contests, and Santa meet-and-greets are all parts of the holiday fun in this town. Henderson’s historic downtown is full of southern hospitality and quaint Hallmark movie charm. This 200-year-old town is traditionally known the area’s rich blues, bluegrass, and barbecue history. Henderson has plenty of unique shopping opportunities. Gift handmade soaps and lotions or a pair of shoes from a century-old shoe store. Each year Main Street’s cast iron lamp posts are accented with beautiful holiday snowflake lights. 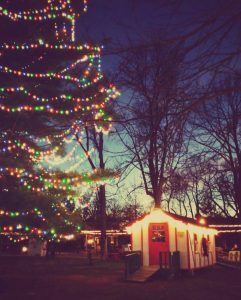 Central Park is transformed into a festive life-size Christmas village, that is great for family-fun. Visit Santa in his workshop, ride Santa’s sleigh, explore the village’s castle, ring the bell on the Christmas train, and gaze in awe at the lit two-story Christmas tree. Complete your visit by staying in one of Henderson’s 19th century downtown homes that are now bed & breakfasts. 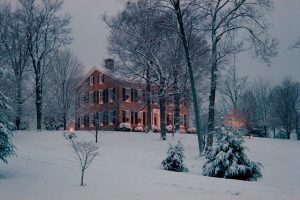 Full of bourbon distilleries and fine Southern cuisine, Bardstown is a miniature metropolis perfect for a winter getaway. Bardstown is located among in an area of Kentucky that is rich with bourbon, horses, and history. You may know it fame from My Old Kentucky Home State Park. During the holidays each room is decorated with a 12-foot tree, and each with its own unique Kentucky theme. Visitors can take a ride on My Old Kentucky Dinner Train and explore the Kentucky Railway Museum. Bardstown’s historic churches and cathedrals host Christmas celebrations such as the Annual Live Nativity and the Mid-Kentucky Chorus’s Beautiful Music of Christmas concert. 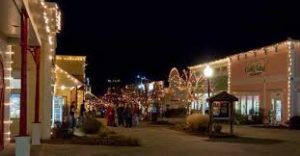 Other celebrations include Light Up Bardstown, Kentucky Railway Museum’s North Pole Express, Downtown Holiday Sneak-a-Peak shopping event, and My Old Kentucky Dinner Train’s New Year’s Eve Excursion. Best known for Daniel Boone National Forest and the Kentucky Music Hall of Fame, Rockcastle is full of adventures and rich musical heritage. Waterfalls, caves, and Civil War sites can be seen on the scenic driving and hiking trails. Handmade crafts, elegant gifts, and area souvenirs make a very unique shopping experience. To top off the charm, The Renfro Valley Entertainment Center hosts a series of Christmas concerts with performers like The Isaacs, Dailey & Vincent, and many more! 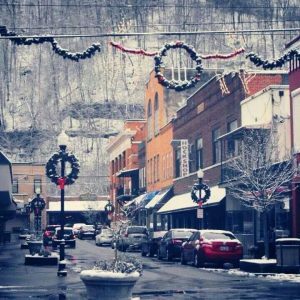 Known as the “Star City of Eastern Kentucky,” Prestonsburg is filled with family-fun adventures. This holiday destination was the first town established in eastern Kentucky. Families looking for fun should check out Jenny Wiley State Resort Park. This State Resort Park has more than 9,000 acres of trails, lakes, cabins, campsites, and a theatre. You might even get a glimpse of what might appear to be one of Santa’s reindeer, but it might be an elk! About 11,000 elk reside in the park and guided elk tours are given from September to March. Prestonsburg rings in the new year with a huge celebration. Carnival rides, a 5K run, local bands, food vendors, and the rising of the Prestonsburg Star make the New Year’s Eve Celebration a winter wonderland. For more travel inspiration, visit our blog for more local travel stories!